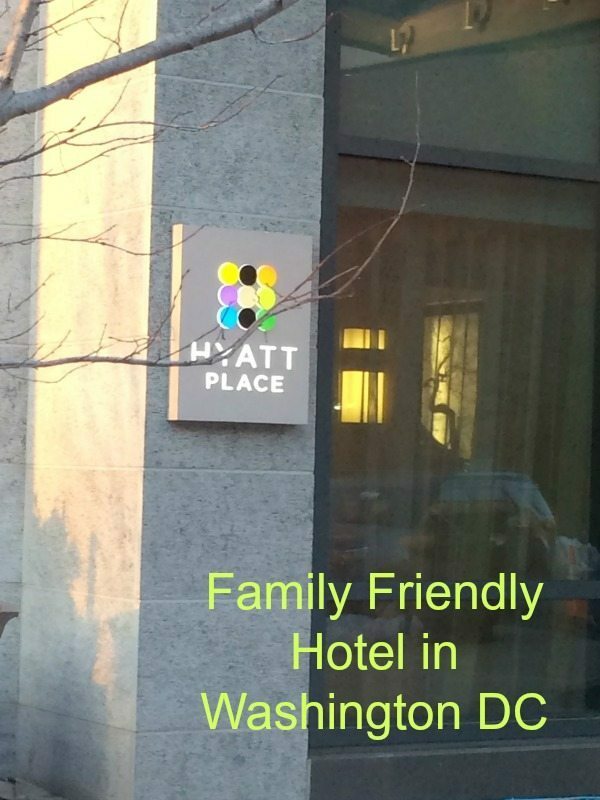 Thank you to the Hyatt Place WashingtonDC/ US Capital for the hosting our family and best hotel for family travel in Washington DC. All the opinions expressed are 100% our own. When we had a third child a lot of things changed such as we lost man on man coverage, we needed a bigger car if anyone ever had a friend come with us, we had to move out of our 3 bedroom home and we lost the chance to comfortably sleep in 1 hotel room. Well that was until we recently stayed at the Hyatt Place DC for a quick spring break getaway. ( I say spring break lightly since there was 5 inches of snow in DC). We were looking for the best hotel for traveling with a family of 5 and here is what we found. Located 10 minutes drive from the Mall and only two blocks from the Metro stop, The Hyatt Place Washington DC is a pioneer in the up and coming NOMa area of DC. (North of Massachutes Ave). This hotel just opened in July of 2014 and is very clean and modern looking. A small lobby is adjoined to the 24 hour food service available at the hotel. It also serves an American Style Breakfast each morning that is included in your room rate. (A big money saver for a family of 5) You can also pick up fresh pastries, snacks, coffee and drinks for sale throughout the day. Now why this hotel is good for family travel, we were placed in the Queen Room which not only had 2 queen sized beds but also a pull out couch that was perfect for the 5th guest in our room. 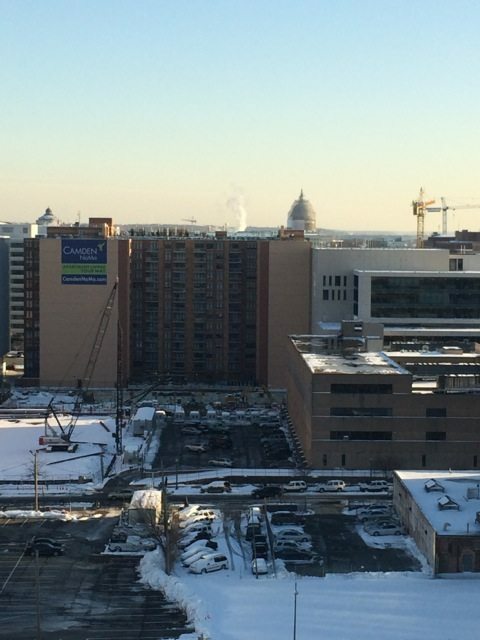 The large window overlooked the capital building, in a distance and may not be there forever, depending on the development of the area. We were on the 15th floor so hopefully they will retain this view. The bathroom was modern and clean and served our family well for this trip. We did not spend much time in the hotel so needing activities for kids was not on our list of priorities for this trip. The Hyatt Place Washington DC also has a small work out room (open 24 hours) and seasonal pool if the kids or adults need to get some energy out. There are so many things to do for free in our country’s capital that it makes for a great family trip. The Smithsonian Museum system is something all families that live here should take advantage of. All these free museums and sites for free and most within walking distance makes for an economical and educational trip. What do you look for in the best hotel for your family travel? Very cool! Someday we will visit our nations capital! Thank you for this review. WE are planning several trips to DC this year so this info came in handy. I would love to visit DC> Going to keep this as a reminder. Looks like a great stay. This looks like you had a great time. I will have to try and get down this way and try out this hotel. This sounds like a great place to stay. I have never done a hotel visit with my kids since they are so young. However, I want to try out Great Wolf Lodge this summer and try to do some resort trips so I guess I will see how it goes. This looks like a great hotel to stay at while visiting DC! Now that the baby is a toddler, I have found traveling as a family of 5 can be a challenge! I can only imagine as the kids get bigger. The 2 queen beds and pull out sound great! I have hopes to take my fam to Washington DC for a family trip. We have debated on taking a family vacay to DC. This hotel looks amazing & relaxing! I might go to D.C. with my sister eventually. It’s good to know there are some nice places to stay! This looks like a really nice hotel to stay at. I will remember this if I ever travel to Washington DC! I have always had a great experience with Hyatts. I want to take the kids to Washington DC one day. Great to know! I am planning on taking my family to DC in the future. Looks like a great place to stay! We love the Hyatt. My favorite location is the one in Jersey City overlooking the Hudson. This looks great. I look for clean and comfy first. Great hotel and I love the rooms. So clean and big. We’re a family of 5, too and it is much more difficult to travel with a group of 5. I’ll remember your recommendation if we’re ever staying in DC. Thanks for the info! I’ve never been to DC, but would love to go when the cherry trees are blooming in the spring! I stayed at The Hyatt in DC. It was lovely. Can’t wait to go back. I’ve never been to washington DC but want to. Definitely will keep this hotel in mind. Thank you!